Germany is the world's top location for trade fairs. Around two thirds of the world's leading trade fairs take place in Germany. The largest annual international trade fairs and congresses are held in several German cities such as Hanover, Frankfurt, Cologne, Leipzig and Düsseldorf. Train factory of August Borsig in 1847. The invention of the automobile. Karl Benz with his wife, Bertha Benz, in a Benz Viktoria, model 1894. The invention of the cruise ship. Albert Ballin's SS Auguste Viktoria in 1890. By 1900 Germany surpassed Britain and the United States in steel production. The German economic miracle was also intensified by an unprecedented population growth from 35 million in 1850 to 67 million in 1913. From 1895 to 1907, the number of workers engaged in machine building doubled from half a million to well over a million. Only 40 percent of Germans lived in rural areas by 1910, a drop from 67% at the birth of the Empire. Industry accounted for 60 percent of the gross national product in 1913. The German chemical industry became the most advanced in the world, and by 1914 the country was producing half the world's electrical equipment. Gross national product and GNP deflator, year on year change in %, 1926 to 1939, in Germany. Via google to Pdf-file of German publication. The post 1931 financial crisis economic policies of expansionary fiscal policies (as Germany was off the gold standard) was advised by their non-Nazi Minister of Economics, Hjalmar Schacht,  who in 1933 became the president of the central bank. Hjalmar Schacht later abdicated from the post in 1938 and was replaced by Hermann Göring. The trading policies of the Third Reich aimed at self sufficiency but with a lack of raw materials Germany would have to maintain trade links but on bilateral preferences, foreign exchange controls, import quotas and export subsidies under what was called the "New Plan"(Neuer Plan) of 19 September 1934. The "New Plan" was based on trade with less developed countries who would trade raw materials for German industrial goods saving currency. Southern Europe was preferable to Western Europe and North America as there could be no trade blockades. This policy became known as the Grosswirtschaftsraum ("greater economic area") policy. 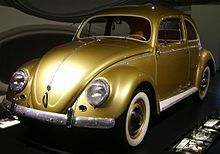 The Volkswagen Beetle was an icon of West German reconstruction. Beginning with the replacement of the Reichsmark with the Deutsche Mark as legal tender, a lasting period of low inflation and rapid industrial growth was overseen by the government led by German Chancellor Konrad Adenauer and his minister of economics, Ludwig Erhard, raising West Germany from total wartime devastation to one of the most developed nations in modern Europe. In 1953 it was decided that Germany was to repay $1.1 billion of the aid it had received. The last repayment was made in June 1971. Apart from these factors, hard work and long hours at full capacity among the population in the 1950s, 1960s and early 1970s and extra labor supplied by thousands of Gastarbeiter ("guest workers") provided a vital base for the economic upturn. By the early 1950s the Soviet Union had seized reparations in the form of agricultural and industrial products and demanded further heavy reparation payments. Silesia with the Upper Silesian Coal Basin, and Stettin, a prominent natural port, were lost to Poland. As of 2013 [update], Germany is the third largest exporter and third largest importer in the world, producing the largest trade surplus as a national economy. As of December 2014 [update], the CPI rate was 0.6 percent. From 1991 to 2010, 40,301 mergers and acquisitions with an involvement of German firms with a total known value of 2,422 bil. EUR have been announced. The largest transactions  since 1991 are: the acquisition of Mannesmann by Vodafone for 204.8 bil. EUR in 1999, the merger of Daimler-Benz with Chrysler to form DaimlerChrysler in 1998 valued at 36.3 bil. EUR. Since the German reunification there have been 52,258 mergers or acquisitions deals inbound or outbound Germany. The most active year in terms of value was 1999 with a cumulated value of 48. bil. EUR, twice as much as the runner up which was 2006 with 24. bil. EUR (see graphic "M&A in Germany"). Germany is part of a monetary union, the Eurozone (dark blue), and of the EU single market. Germany is an advocate of closer European economic and political integration. Its commercial policies are increasingly determined by agreements among European Union (EU) members and EU single market legislation. Germany introduced the common European currency, the euro on 1 January 1999. Its monetary policy is set by the European Central Bank in Frankfurt. $27.9 billion Beate Heister (b. Albrecht) & Karl Albrecht Jr.
$20.3 billion Theo Albrecht Jr.
Germany has a social market economy characterised by a highly qualified labor force, a developed infrastructure, a large capital stock, a low level of corruption,  and a high level of innovation. It has the largest national economy in Europe, the fourth largest by nominal GDP in the world, and ranked fifth by GDP (PPP) in 2015. In 2010 agriculture, forestry, and mining accounted for only 0.9% of Germany's gross domestic product (GDP) and employed only 2.4% of the population,  down from 4% in 1991. Agriculture is extremely productive, and Germany is able to cover 90% of its nutritional needs with domestic production. Germany is the third largest agricultural producer in the European Union after France and Italy. Germany's principal agricultural products are potatoes, wheat, barley, sugar beets, fruit, and cabbages. Despite the country's high level of industrialization, almost one-third of its territory is covered by forest. The forestry industry provides for about two-thirds of domestic consumption of wood and wood products, so Germany is a net importer of these items. Strip mining lignite at Tagebau Garzweiler near Grevenbroich, Germany. The world's largest coherent chemistry plant BASF in Ludwigshafen. Industry and construction accounted for 30.1% of gross domestic product in 2017, and employed 24.2% of the workforce. Germany excels in the production of automobiles, machinery, electrical equipment and chemicals. With the manufacture of 5.2 million vehicles in 2009, Germany was the world's fourth largest producer and largest exporter of automobiles. German automotive companies enjoy an extremely strong position in the so-called premium segment, with a combined world market share of about 90%. Bavaria (l.) is a tourism destination and Berlin (r.) a centre of creative industries. In 2008 services constituted 69% of gross domestic product (GDP), and the sector employed 67.5% of the workforce. The subcomponents of services are financial, renting, and business activities (30.5%); trade, hotels and restaurants, and transport (18%); and other service activities (21.7%). Germany is the world's fifth largest consumer of energy, and two-thirds of its primary energy was imported in 2002. In the same year, Germany was Europe's largest consumer of electricity, totaling 512.9 terawatt-hours. Government policy promotes energy conservation and the development of renewable energy sources, such as solar, wind, biomass, hydroelectric, and geothermal energy. As a result of energy-saving measures, energy efficiency has been improving since the beginning of the 1970s. The government has set the goal of meeting half the country's energy demands from renewable sources by 2050. The largest solar power and third-largest wind power capacity in the world is installed in Germany. In 2000, the red-green coalition under Chancellor Schröder and the German nuclear power industry agreed to phase out all nuclear power plants by 2021. The conservative coalition under Chancellor Merkel reversed this decision in January 2010, electing to keep plants open. The nuclear disaster of the Japanese nuclear plant Fukushima in March 2011 however, changed the political climate fundamentally: Older nuclear plants have been shut down. And a general phase out until 2020 or 2022 is now probable. Renewable energy yet still plays a more modest role in energy consumption, though German solar and windpower industries play a leading role worldwide. In 2009, Germany's total energy consumption (not just electricity) came from the following sources:  Oil 34.6%, Natural gas 21.7%, Lignite 11.4%, Bituminous coal 11.1%, Nuclear power 11.0%, Hydro and wind power 1.5%, Others 9.0%. The largest German airports are the Frankfurt International Airport and the Munich International Airport, both are global hubs of Lufthansa. Other major airports are Berlin Tegel, Berlin Schönefeld, Düsseldorf, Hamburg, Hanover, Cologne-Bonn, Leipzig/Halle and in the future Berlin Brandenburg International Airport. Germany is also one of the leading countries in developing and using green technologies. Companies specializing in green technology have an estimated turnover of €200 billion. German expertise in engineering, science and research is eminently respectable. ^ a b c d "World Economic Outlook Database, October 2018, Germany". International Monetary Fund. October 2018. Archived from the original on 28 April 2018. Retrieved 19 June 2017. ^ a b c d e f g h i j "Germany". The World Factbook. Central Intelligence Agency (CIA). 2018. Retrieved 2 July 2018. ^ "Homepage - Federal Statistical Office (Destatis)". Archived from the original on 28 January 2017. ^ "Homepage - Federal Statistical Office (Destatis)". Archived from the original on 2 February 2017. ^ "National economy & environment - Earnings and Earnings differences - Development of gross earnings - Federal Statistical Office (Destatis)". Destatis.de. 22 March 2017. Archived from the original on 14 November 2016. Retrieved 27 March 2017. ^ "Lohn- und Einkommensteuerberechnung". Parmentier.de. Archived from the original on 10 March 2017. Retrieved 27 March 2017. ^ "Ease of Doing Business in Germany". Doingbusiness.org. Archived from the original on 17 October 2017. Retrieved 21 November 2017. ^ a b "Germany - WTO Statistics Database". World Trade Organization. Archived from the original on 3 September 2017. Retrieved 1 March 2017. ^ "Stock of Foreign Direct Investment". CIA World Factbook. Archived from the original on 30 January 2017. ^ "Deutsche Bundesbank" (PDF). Archived (PDF) from the original on 28 April 2018. Retrieved 9 July 2017. ^ "Germany Government Debt: % of GDP". CEIC Data - UK. 2018. Retrieved 2018-08-04. ^ "Development aid rises again in 2016 but flows to poorest countries dip". OECD. 11 April 2017. Archived from the original on 18 September 2017. Retrieved 25 September 2017. ^ "Sovereigns rating list". Standard & Poor's. Archived from the original on 28 September 2011. Retrieved 26 May 2011. ^ a b c Rogers, Simon; Sedghi, Ami (15 April 2011). "How Fitch, Moody's and S&P rate each country's credit rating". The Guardian. London. Archived from the original on 1 August 2013. Retrieved 31 May 2011. ^ "Scope affirms Germany's credit rating of AAA with Stable Outlook". Retrieved 2018-11-02. ^ "Germany Foreign Exchange Reserves". CEIC Data - UK. 2018. Retrieved 2018-08-05. ^ Spicka 2007, p. 2. ^ a b "Germany: Spend More At Home". imf.org. Archived from the original on 8 January 2018. Retrieved 28 April 2018. ^ "Scale and Scope — Alfred D. Chandler, Jr. | Harvard University Press". Hup.harvard.edu. Archived from the original on 20 November 2014. Retrieved 13 August 2014. ^ Moulson, Geir (9 February 2017). "German exports hit new high in 2016, trade surplus widens". Associated Press. Archived from the original on 6 July 2017. Retrieved 7 February 2018. ^ "National economy & environment - Foreign trade - Federal Statistical Office (Destatis)". Archived from the original on 13 November 2015. 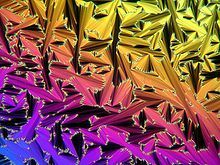 ^ Library of Congress – Federal Research Division (April 2015). "Country Profile: Germany" (PDF). p. 10. Archived from the original on 14 February 2006. Retrieved 23 April 2015. Exports are responsible for one-third of total economic output, and at the prevailing dollar–euro exchange rate, no country exports more merchandise. ^ "Germany's capital exports under the euro | vox". Voxeu.org. Archived from the original on 22 February 2014. Retrieved 13 August 2014. ^ Destatis. "CIA Factbook". Archived from the original on 2 May 2015. Retrieved 23 April 2015. ^ "What Germany offers the world". The Economist. Archived from the original on 28 April 2018. Retrieved 28 April 2018. ^ Wind Power Archived 10 December 2006 at the Wayback Machine Federal Ministry of Economics and Technology (Germany) Retrieved 30 November 2006. ^ Nicola, Stefan (9 May 2014). "Renewables Meet Record 27 Percent of German Electricity Demand". Bloomberg. Archived from the original on 11 May 2015. Retrieved 23 April 2015. ^ "Forbes Global 2000: Germany's Largest Companies". Forbes. Archived from the original on 8 April 2015. Retrieved 29 March 2018. ^ "trade shows in Germany, fairs Germany, trade fair Germany, trade show venue Germany". Archived from the original on 29 July 2014. ^ "Trade fairs in Germany". German National Tourist Board. Archived from the original on 2 February 2014. Retrieved 5 February 2014. ^ Compare: Mitchell, Allan (2006). Great Train Race: Railways and the Franco-German Rivalry, 1815–1914. Berghahn Books. pp. 54–55. There were until  [...] only the beginnings of a nexus of technological innovation and economic growth, the erratic construction of a platform for what might later be justifiably termed a take-off in Germany. But there is little evidence within the given chronological framework for a full-blown notion of an Industrial Revolution [...]. ^ "Germany's Strong Economic Growth After 1871 :: Papers". Archived from the original on 23 March 2015. ^ "Class and Politics in Germany, 1850 to 1900". Archived from the original on 23 April 2015. ^ "Germany - history - geography". Archived from the original on 3 May 2015. ^ Gaettens, Richard (1982). Geschichte der Inflationen : vom Altertum bis zur Gegenwart (Nachdr. ed.). München: Battenberg. pp. 279–298. ISBN 3-87045-211-0. ^ "econ161.berkeley.edu". Archived from the original on 11 May 2008. Retrieved 15 August 2007. ^ Lee, Stephen (1996). Weimar and Nazi Germany. Oxford: Heinemann. p. 63. ISBN 043530920X. ^ Lee, Stephen (1996). Weimar and Nazi Germany. Oxford: Heinemann. p. 60. ISBN 043530920X. ^ Reynoldson, Fiona (1996). Weimar and Nazi Germany (Foundation ed.). Oxford: Heinemann. p. 49. ISBN 0435308602. ^ a b Boyes, Roger (24 August 2007). "Germany starts recovery from €2,000bn union". London: Times Online. Archived from the original on 29 May 2010. Retrieved 12 October 2009. ^ "Business America. (27 February 1989). German Democratic Republic: long history of sustained economic growth continues; 1989 may be an advantageous year to consider this market - Business Outlook Abroad: Current Reports from the Foreign Service". Business America. 1989. Archived from the original on 9 November 2007. Retrieved 2 October 2007. ^ Bruttoinlandsprodukt (Vierteljahres- und Jahresangaben) Archived 13 November 2010 at the Wayback Machine Statistisches Bundesamt. ^ a b c d "CIA Factbook: Germany". Cia.gov. Archived from the original on 11 February 2016. Retrieved 13 August 2014. ^ Hopkins, Kathryn (14 November 2008). "Germany officially in recession as OECD expects US to lead recovery". London: The Guardian. Archived from the original on 4 September 2013. Retrieved 1 May 2010. ^ Thesing, Gabi (13 November 2008). "bloomberg.com, German Economy Enters Worst Recession in 12 Years". Bloomberg.com. Archived from the original on 13 June 2010. Retrieved 13 August 2014. ^ "Country Comparison :: Exports". The World Factbook. Central Intelligence Agency. ISSN 1553-8133. Archived from the original on 28 October 2013. Retrieved 9 August 2012. ^ "Country Comparison :: Imports". The World Factbook. Central Intelligence Agency. ISSN 1553-8133. Archived from the original on 4 October 2008. Retrieved 9 August 2012. ^ a b c CIA. "CIA Factbook". Archived from the original on 11 February 2016. Retrieved 2 August 2009. ^ "Wind Power". Federal Ministry of Economics and Technology. Archived from the original on 10 December 2006. Retrieved 27 March 2011. ^ UFI, the Global Association of the Exhibition Industry (2008). "Euro Fair Statistics 2008" (PDF). AUMA Ausstellungs- und Messe-Ausschuss der Deutschen Wirtschaft e.V. p. 12. Archived from the original (PDF) on 18 July 2011. Retrieved 24 September 2011. ^ "Defying the Euro Crisis". Spiegel Online. 27 December 2011. Archived from the original on 27 December 2011. ^ "Productivity - GDP per hour worked - OECD Data". theOECD. Archived from the original on 24 January 2018. Retrieved 28 April 2018. ^ "Germany's Jobless Rate Drops to Record Low as Economy Booms". Bloomberg.com. 3 January 2018. Archived from the original on 3 January 2018. Retrieved 3 January 2018. ^ RTT staff writer. "German January Unemployment Rate At Record Low" (PDF). p. 78. Archived from the original on 2 February 2015. Retrieved 3 February 2015. ^ "The 100 Top Brands 2010". Interbrand. Archived from the original on 12 February 2011. Retrieved 27 March 2011. ^ Gavin, Mike (23 September 2010). "Germany Has 1,000 Market-Leading Companies, Manager-Magazin Says". Businessweek. New York. Archived from the original on 30 April 2011. Retrieved 27 March 2011. ^ "Statistics on Mergers & Acquisitions (M&A) - M&A Courses | Company Valuation Courses | Mergers & Acquisitions Courses". Imaa-institute.org. Archived from the original on 6 January 2012. Retrieved 2014-08-13. ^ Frost, Simon. "Berlin outranks London in start-up investment". euractiv.com. Archived from the original on 6 November 2015. Retrieved 28 October 2015. ^ "Global 500: Countries – Germany". Forbes. 26 July 2010. Archived from the original on 23 March 2011. Retrieved 27 March 2011. ^ "Information and Statistics about Mergers & Acquisitions (M&A) Germany". IMAA-Institute. Archived from the original on 22 February 2018. Retrieved 22 February 2018. ^ Berg, S., Winter, S., Wassermann, A. The Price of a Failed Reunification Archived 20 November 2007 at the Wayback Machine Spiegel Online International. 5 September 2005. Retrieved 28 November 2006. ^ "Germany may become 22nd EU state with federal minimum wage". Germany News.Net. Archived from the original on 14 July 2014. Retrieved 7 July 2014. ^ "The World's Billionaires". Forbes. Archived from the original on 24 April 2013. Retrieved 4 July 2016. ^ "These Are Germany's Power Cities". Archived from the original on 13 March 2014. Retrieved 1 March 2014. ^ "CPI 2009 table". Transparency International. Retrieved 18 November 2009. ^ "The Innovation Imperative in Manufacturing: How the United States Can Restore Its Edge" (PDF). Archived (PDF) from the original on 22 November 2009. Retrieved 26 September 2010. ^ 31.7% —or about 11,076,000 hectares— of Germany is forested Archived 21 February 2010 at the Wayback Machine, mongabay.com, 2005. ^ a b c d Gürtler, Detlef: Wirtschaftsatlas Deutschland. Rowohlt Berlin, 2010. ^ Venohr, Bernd; Meyer, Klaus E. (2007). "The German Miracle Keeps Running: How Germany's Hidden Champions Stay Ahead in the Global Economy" (PDF). Working Paper 30. FHW Berlin. Archived from the original (PDF) on 26 March 2009. Retrieved 9 October 2009. ^ Venohr, Bernd (2010). "The power of uncommon common sense management principles - The secret recipe of German Mittelstand companies - Lessons for large and small companies" (PDF). Archived (PDF) from the original on 17 October 2011. Retrieved 8 December 2010. ^ Wall, Robert (17 March 2013). "China Replaces U.K. in Top-Five Arms Exporters Headed by U.S." Bloomberg.com. Archived from the original on 13 August 2014. Retrieved 13 August 2014. ^ "Interim Update" (PDF). UNWTO World Tourism Barometer. UNWTO. April 2011. Archived from the original (PDF) on 1 January 2015. Retrieved 26 June 2011. ^ "Tourism Highlights 2014 edition" (PDF). UNWTO. Archived from the original (PDF) on 14 February 2015. Retrieved 26 March 2015. ^ "2013 Travel & Tourism Economic Impact Report Germany" (PDF). WTTC. Archived from the original (PDF) on 3 December 2013. Retrieved 26 November 2013. ^ "Wind Power". Archived from the original on 10 December 2006. Retrieved 2011-03-27. CS1 maint: BOT: original-url status unknown ( link) Federal Ministry of Economics and Technology (Germany) Retrieved 30 November 2006. ^ "World Economic Outlook Database, April 2015, General government gross debt (National currency, Percent of GDP)". International Monetary Fund. April 2015. Archived from the original on 5 February 2016. Retrieved 26 January 2016. ^ "Third quarter of 2015 compared with second quarter of 2015 - Government debt fell to 91.6 % of GDP in euro area". Eurostat. 22 January 2016. Archived from the original on 24 January 2016. Retrieved 26 January 2016. ^ "German Government Achieves 'Historic' Budget Surplus". The World Street Journal. 13 January 2016. Archived from the original on 13 March 2016. Retrieved 26 January 2016. ^ "Reuters: Fitch Affirms Germany at 'AAA'; Outlook Stable". Reuters. 8 January 2016. Archived from the original on 2 February 2016. Retrieved 26 January 2016. ^ "German 'debt clock' reverses for first time in 20 years". Financial Times. 4 January 2018. Archived from the original on 4 January 2018. Retrieved 4 January 2018. ^ "Energy Consumption in Germany" (in German). Archived from the original on 27 April 2011. Retrieved 13 August 2014. ^ "Trump: How much of Germany's gas comes from Russia?". BBC News. 11 July 2018. ^ "Germany's Autobahn faces blanket speed limits". May 2013. ^ "Geschäftsbericht 2006 der Deutschen Bahn AG". Archived from the original on 9 August 2007. Retrieved 2011-03-27. , Deutsche Bahn. Retrieved 19 October 2007. ^ "German Railway Financing" (PDF). p. 2. Archived from the original (PDF) on 10 March 2016. ^ Research in Germany Archived 20 August 2010 at the Wayback Machine German Embassy, New Delhi. Retrieved 2010-28-08. ^ "Germany's Technological Performance". Federal Ministry of Education and Research. 11 January 2007. Archived from the original on 25 August 2011. Retrieved 21 August 2011. 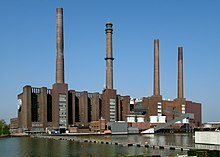 ^ Industry strongly engaged in research Archived 21 November 2011 at the Wayback Machine Facts about Germany. Retrieved 2010-29-08. ^ Thomasson, Emma. "Asleep at the wheel? Germany frets about economic car crash". reuters.com. Archived from the original on 1 October 2017. Retrieved 28 April 2018. ^ Debt 'explosion' awaits unless policymakers defuse demographic timebomb, warns IMF chief Archived 3 December 2017 at the Wayback Machine, The Telegraph. Retrieved 2016-6-03. Spicka, Mark E. (2007). Selling the Economic Miracle: Reconstruction and Politics in West Germany. Berghahn Books. ISBN 978-1-84545-223-0. Officially the Republic of China, participates as " Separate Customs Territory of Taiwan, Penghu, Kinmen and Matsu", and "Chinese Taipei" in short.